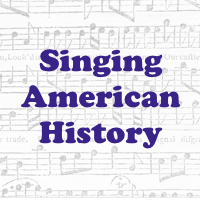 Singing American History is a program created by Valerie Rogotzke, a classically trained singer who has performed in concert in the United States, Europe, and Asia. She holds a bachelor's degree from Peabody Conservatory, a master's degree in voice from Rice University, and is currently a Ph.D. candidate at Yale University in music. She conducts research on music, political history, and religion, and she completed an National Endowment for the Humanities Summer Institute in 2013 on teaching American history through popular song.